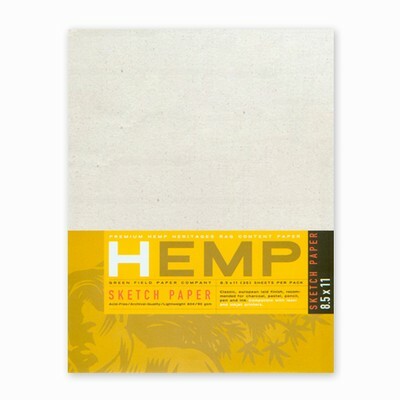 Our Hemp Heritage paper is now available in a popular sketch weight (90 gsm). Featuring an elegant European laid finish, this paper is ideal for charcoal, pastel, pencil, and even light wash. Available in 8.5” x 11” and 11” x 14,” each pack contains35 sheets. Natural white color. Acid-free, chlorine-free and archival quality. Inkjet printer compatible. Hemp is a fast-growing alternative to trees that has been used to make paper for thousands of years. This historical plant holds great promise as a renewable tree-free source of fiber for the future. Hemp Heritage ® is created using hemp pulp which is combined with post consumer pulp. The result is a premium quality paper with an elegant finish.